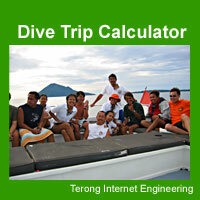 Dive Trip Calculator - Let visitors to plan their own dive travel plan. A new application for small to medium size clubs (country clubs, leagues, teams, etc.) that is used to maintain a current database of all their members. No database required. Let visitors to plan their own dive travel plan. Calculate total cost of trip along with the equipment rental. Web site owner can change the price and package easily. Dive shops own a web site can use Terong.com Dive Trip Calculator to let visitors play around with their next own dive travel plan. In only 3 simple steps, the potential guests can get the estimated expense they would pay based on dive sites selected and equipment rented. First step is to enter the number of divers and detail of equipment rented. Second step is to select the dive sites and number of days. The third step is to see the summarized expense based on their plan. The planned trip report also can be sent to both dive shops and the visitor. To try it on your own, see demo. Let visitors to plan their own dive travel plan. Calculate total cost of trip along with the equipment rental. Web site owner can change the price and package easily. Trap Line - Trap Line is for fur trappers wanting to maintain records of their catches, sets, fur sales, complete trap inventory and trapping activities. Records of catches, set types, set locations, trap types, trap modifications, etc. can provide valuable information.